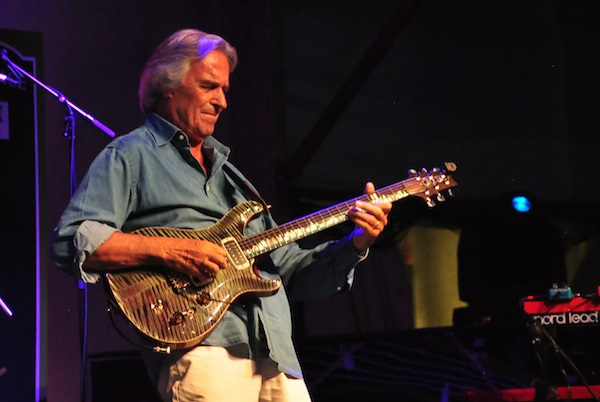 Crowd: About 1200 people packed into the smoldering hot tent at Nathan Phillips Square to the see Jazz Fusion legend John McLaughlin. Old and young alike were ever present and overall it was a well mixed culturally diverse and appreciative crowd, that stayed until the very end. Another 250 or so gathered outside in an attempt to capture the show. After a 90 minute set, a small crowd of 75 waited patiently for the master for photo ops or a signature, proving that Mr. McLaughlin still has a very loyal fan base that just doesn’t quit. Style: Jazz Fusion pioneer and legend. Technicalities: Sound and lights provided by Metalworks was top notch. There was a clear difference between opener Courtney Pine and the headliners. John thanked his sound man at the end of the set, presumably he brought his own guy. Yes it was sweltering, but honestly most forgot the humidity when the music started. So wonderful, when you don’t just hear a legend , but when the band were so good it was perfect by my standard., Courtney Pine did a great job of working the crowd, and his own excellent band made the show really enjoyable.Damn ! wished I had stayed around to meet the master !! Any body out there get the chance ?